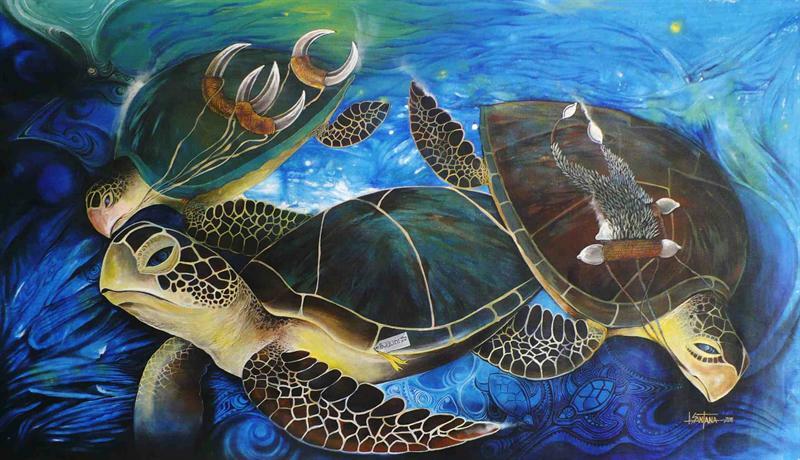 'Bobodi, Navigating the Sea of Predators is a painting dedicated to my son, Bobodi like a turtle, tagged and sent out into the sea of predators. Life is like a turtle, tagged and monitored on how it will survive the ocean full of unexpected predators. As parents, we have tagged our children and expect them to be the best, survive and bring back results and care for us as parents when we get old. Sometimes unexpected siutations occur and we loose them, those are the saddest moments in our lives.